Members of the 3rd Special Forces Group, 2nd Battalion salute the casket of U.S. Army Sgt. La David Johnson at his burial service in Hollywood, Fla., on Oct. 21. Johnson and three other U.S. soldiers were killed in an ambush in Niger on Oct. 4. On Thursday, the Pentagon will release the results of an investigation into the deaths of four American soldiers who were ambushed last October by ISIS fighters in the African country of Niger. The attack raised questions about whether the soldiers had enough training and equipment, and whether they were taking too many risks in working with local forces in Africa. NPR has obtained details of the yet-to-be-released report, which says there was no single failure, and no deficiency was the sole cause for the men's deaths outside the village of Tongo Tongo on Oct. 4, 2017. But the report says the soldiers did not have the necessary training before arriving in Africa and before the mission. And it says there was a "contradicting and confusing" approval process for missions up the chain of command of the American forces in Africa. The U.S. military has been in Niger since 2013 to train, advise and assist the country's military in its battle against ISIS-linked extremists. The four soldiers were part of a 12-member team, together with Nigerien soldiers, that had started out on a mission to meet village elders. But then it switched to a more dangerous one: visiting a site recently vacated by a terrorist leader and his fighters. Drone footage showed the site was empty, and the soldiers were ordered by a junior officer to check the site for any intelligence information. Who should have approved the mission, and at what level? What was the responsibility of the top generals of the United States Africa Command, who oversee all military operations? And why did the chief of staff from the Africa Command write the report instead of an independent officer? The report says the Americans were outgunned by dozens of ISIS fighters, and that all four soldiers died instantly, along with five Nigerien soldiers. All team members fought bravely, the report says, and some went back to try to help their doomed comrades. The four Americans killed were Staff Sgt. Bryan Black, Staff Sgt. 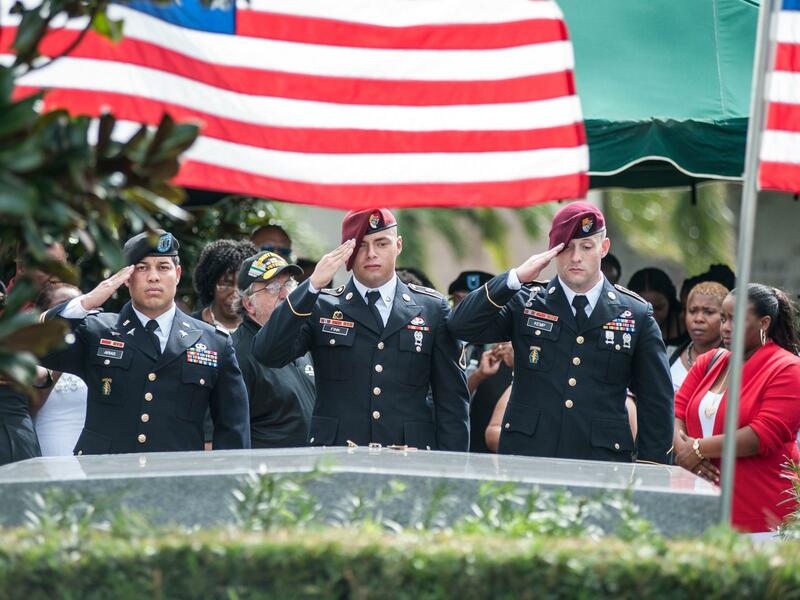 Dustin Wright — both Green Berets — and Staff Sgt. Jeremiah Johnson and Sgt. La David Johnson. Two other Americans were wounded. French Mirage jets showed up as the ambush was coming to an end, made several low passes and scattered the terrorists, but did not fire. The report says that's because the pilots could not distinguish between friend and foe. Still, the report says, the French action saved lives. One retired U.S. officer with experience in Africa tells NPR the American team heading to the terrorist site should have planned better and should have had heavier firepower, a medevac helicopter and a quick reaction force in case something went wrong. From now on, officials say, all special forces missions will include a drone flying above — and a medevac two hours away. We are breaking news this morning on a Pentagon investigation into the deaths of four American soldiers. What's known is they were ambushed by ISIS fighters in the West African country of Niger. What wasn't known is, did they have proper training and equipment? And were they taking too many risks? NPR's Tom Bowman has learned how the report answers those questions. TOM BOWMAN, BYLINE: The report will say there was no single failure, no deficiency as a sole reason the men died outside the village of Tongo Tongo on an October afternoon. But the report says the soldiers did not have the necessary training before arriving in Africa and before the mission. And there was a contradicting and confusing approval process for missions up the chain of command of the American special operations forces. The four soldiers were part of a 12-member team, together with Nigerien soldiers, that started out on a mission just to meet village elders. But then it switched to a more dangerous one, visiting a site recently vacated by a terrorist leader and his fighters. Drone footage showed the site was empty. And the soldiers were ordered by a junior officer to check the site for any intelligence information. A synopsis of the report focuses on the Special Operations Command in Africa, although it does not blame any individuals. It leaves many questions unanswered - who should have approved the mission and at what level? And what was the responsibility of the top generals of Africa Command, who oversee all military operations? And why did the chief of staff from Africa Command write the report instead of an independent officer? The report says the Americans were outgunned by dozens of ISIS fighters and that all four soldiers died relatively quickly along with five Nigerien soldiers. All team members fought bravely, the report says. And some went back to try to help their doomed comrades. French Mirage jets showed up as the ambush was coming to an end, made several low passes, scattered the terrorists but did not fire. That's because the pilots could not distinguish between friend and foe. Still, the report says, the French action saved lives. One retired officer with experience in Africa tells NPR, the American team heading to the terrorist site should have planned better, had heavier firepower, a medevac and a quick reaction force in case something went wrong. Now, officials say, all special operations missions will include a drone flying above and a medevac two hours away.